I firmly stand by the notion that not all pastries need to be sweet. I am guilty of overlooking such savory beauties from time to time and could always use a reminder that not all baked goods need to be sugar-clad to be delicious. With the amount of baking I do, it is nice (for my palette and waist-line) to switch it up. While the majority of the items that come out of my oven are sweet, they rarely serve as a proper meal. I do love the idea of dessert for every meal, but it probably is not very realistic. Seasonal vegetables and herbs provide tons of flavour and create equally delicious dishes, especially when paired with flakey, buttery crusts. So, if you want to increase your baking game but are running out of hours of the day where eating sweets is deemed acceptable, then try out some savory pastries that can be enjoyed at any meal. Last weekend, I hosted a casual yet intimate dinner party out on our patio. I wanted to utilize all of the abundance of summer produce and make veggies the stars of my dishes. I decided to use vine-ripe tomatoes and organic zucchini (the epitome of summer vegetables) and turn them both into super-flavorful, sumer tarts. They were easy to prepare, were a little unexpected, and packed a big punch of fresh flavour - all things I look for when creating a dinner party menu. Pre-heat oven to 375 degrees. Line a baking sheet with parchment. Place the puff pastry sheet on top of the parchment. Score the inside of the puff pastry, about 1/2" in from the edges, with a paring knife - keeping carful not to cut all the way through. Prick the inside portion (all over) with the tines of a fork. Mince the garlic. Sprinkle with a bit of salt and smear it against a cutting board with the side of the blade of a knife to make a paste. Mix with a few tablespoons olive oil and brush in the inside surface of the pastry dough. In a single layer, arrange the tomato slices. Sprinkle with salt and pepper. Drizzle with a touch more olive oil. Bake for about 25-30 minutes, or until puffed and golden. Sprinkles with fresh oregano and grated parmesan before serving. Preheat oven to 350 degrees. Line a baking sheet with parchment. Roll out pie crust to about 12" in diameter and place on top of the parchment. Mix together the cream cheese and chopped herbs. Add salt and pepper to taste. Spread on the cream cheese mix, leaving a 1" boarder around the edge. Starting from the outside, fan out the zucchini slices in concentric circles, ending in the middle. The slices should overlap slightly between the rows. Drizzle the top with olive oil, salt, and pepper. Fold up the edges of the pie dough around the zucchini and press to seal. Mix the egg yolk and milk together. Brush on the folded portion of the pie dough. Bake for 25-30 minutes, or until golden. Sprinkle with fresh herbs before serving. In trying to make things even easier for myself, I used my secret ingredients, Cascade Platinum, when it came to clean-up. I partnered up with My Cascade to create a sparkling clean dinner party, and let me tell you, this stuff really works. Don't make things more difficult than they need to be - make some simple, savory summer tarts and use some Cascade Platinum. Instant dinner party success! You're welcome! Disclosure: this post is in partnership with Cascade. All opinions are my own. Thank you for supporting the brands that keep Style Sweet CA running. Let's Host a Dinner Party! When I was single and in my early twenties my idea of perfect summer entertaining was a BBQ in the backyard. Now that I am a bit older, those get togethers have turned into dinner parties. Okay, that may seem completely bougie and pretentious of me to say, but I swear they can be just as fun and totally feasible. For me, it just means that I've exchanged the paper plates for proper dishes and real utensils. Might as well put all that stemware we got from our wedding to use, right? Hosting, even with disposable plates and the occasional red, plastic cup, seems daunting, messy, and time consuming in it self. Throw in extra dishes to wash and you'll be wishing you'd just made a reservation. Am I right? Wrong! I've teamed up with Cascade Platinum and Chef Michael Smith to share some tips and tricks for hosting your own dinner party that you can actually enjoy. I love to feed others, yet hosting events always makes me a bit anxious. Will I have enough food? Will everything be ready on time? How am I supposed to entertain while doing a million things at once? How can I appear cool, calm, and collected when the kitchen is a mess? Thankfully, I never host alone and usually prepare a game plan well in advanced. For this dinner party I implemented a few of my own hosting "rules" to create a rustic yet elegant night with family and friends. 1) Be yourself: Let the food and decor reflect you. One of the easiest things you can do for yourself is to just be you. Just because we are calling it a "dinner party" that doesn't have to mean a 5-course meal on your finest china. For me, this means cooking approachable food that still tastes great and creating an intimate yet comfortable environment so guests can relax. For the food, there is nothing wrong with "simple" as long as it tastes good and looks appetizing. I've learned the hard way not to cook complicated dishes that I have never tried out before when having company over. Instead, I use fresh flavors that really speak for themselves and dishes that don't have a lot of working parts - more things that are ready to be eaten straight-out-of-the-oven, or with just a few garnishes. For the the decor, I like to use my eclectic taste - more of an excuse to use a mix-mash of serving dishes and not worrying about having enough matching place settings. Some planning and coordinating is still involved, but it is a lot less stressful than worrying about which utensils go with which plates and so on. For this event in particular, I decide to entertain out on the patio. With the sun not setting until nearly 9pm these days and all my new spring flowers and foliage looking fantastic out there, why not take advantage of the fresh air and abundance of natural light? Building off of what I already mentioned about the food, make a plan and find ways to cut yourself a break. Choosing recipes that can be made ahead of time or those with ingredients than can be store-bought will save you time, energy, and sanity. For this event, I wanted to make sweet and savory tarts. Puff pastry is one ingredient that I always buy from the freezer section without shame, so finding a tart recipes using it puts me ahead of schedule. For the other tarts using a basic pie crust, I made it in advance - but you could also use store-bought for an even short(er)-cut. Since I like to incorporate fresh, seasonal ingredients, I would rather spend my time making the produce the star and cutting back elsewhere when applicable. Try one-pot meals for the main dish! Or better yet, try a recipe that requires not cooking/baking at all like Chef Michael Smith's Salt-and-Pepper Melon for an appetizer (like I did) - tons of flavor with hardly any work at all! All in all, the more you can prep (let it be food, your table setting, your playlist), the more time you will have later to enjoy with your guests. Spend time to save time - as Smith says. Between my husband Brett and I, we've developed a system where we share the roles of entertaining the guests, finishing up the food, and clean-up. It can be hard to maintain everything at the same time while trying to enjoy your guests, so having someone to help out is really helpful. However, now that there is a baby involved, we had to reconsider some of our ways. The dirty dishes were one of the things we were able to compromise on, and instead of cleaning as we go, they were all saved for after the guests left. Cue our third host/secret ingredeint, Cascade Platinum, to help get all those dishes sparkling clean again. Not only did we not have to clean as the party was happening or worry about the food that continued to cake on as we put the baby to bed, but there was no pre-rinse required so these tired parents could get to sleep in no time while MyCascade did all the work. Just because we have a baby, I d0 not want to stop doing some of the things I truly love, like cooking for loved ones and entertaining. And now that our time and energy is split up even more, it really is the simple things like an easy clean up or 10 minutes saved that I would normally spend on pre-rinsing dishes that really make it possible. Slice ripe cantaloupe into wedges. Place on a serving plate and drizzle with good olive oil. Sprinkle with salt, pepper, and fresh lime zest. So simple, right? Bold yet unexpected flavors - exactly how I like to entertain. 1) Place 2 cups of water plus 2 tablespoons granulated sugar in a small saucepan. Bring to a simmer. Add in the Earl Grey Tea and steep over low heat for about 30 minutes. Remove the tea and continue to reduce the liquid down to about a 1/2 cup. Remove from heat and let cool. 2) Meanwhile, place the remaining sugar and 1/2 cup water in a small saucepan. Bring to a boil. Reduce the heat to a simmer and add in the lavender. Continue to cook on low for about 10 minutes, or until syrupy. Remove from heat and let cool. Once cool, strain out the lavender. 3) To make one drink, place ice in a small tumbler. Stir in about 2 tablespoons tea syrup and 1 tablespoons lavender syrup. Top with about 1/2 - 3/4 cup soda or sparkling water. Serve with sliced lemon, if desired. It surely has been a CRAZY summer. I have been working on a major project (details to come soon) and we are still getting settled after out move. I've been super busy freelancing - hence all the shared recipes lately, but I finally have a spankin' new recipe for you, my lovely, devoted blog readers. 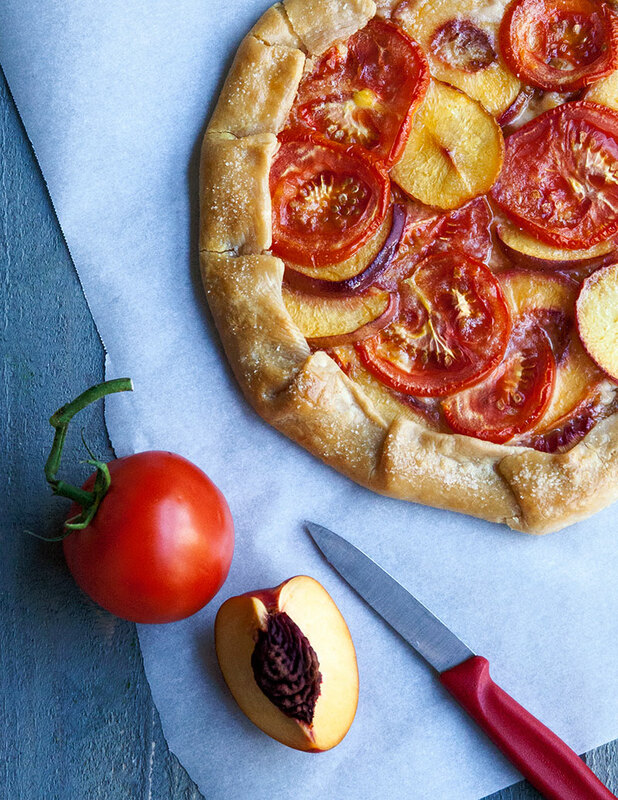 This late summer Peach Tomato Tart will knock your post-Labor Day socks off. I know, most of us are already in fall mode. But while Starbucks is screaming "Pumpkin Spice Latte," my Whole Foods produce aisle says something differently. I always believe in cooking with the seasons and do my best to shop local and organic. Maybe it is just us here in the Pacific Northwest, but we still have an abundance of stone fruit and the most glorious heirloom tomatoes I've ever seen. I've heard of peachy tomato jam and peach ketchup before. Once ripe, they are both perfectly sweet and juicy. And since a tomato is technically a fruit, the sweet duo should pair nicely with each other. I kind of make up this recipe as I went, but it turned out fabulous. Looking for something a bit different? Check it out! Time to face the music. I think summer is just about over. If not only going by what my calendar says, mother nature is giving some clear signs for cooler climates. I just "harvested" the last of my cherry tomatoes for one final summer recipe. Let's talk about tomatoes for a second. Now you might think since I can cook, bake, paint, etc- that I am all-around pretty crafty. Well, this is probably true for the most past- but a gardener, I am not. No green thumbs for this girl. However, this is first season where I actually was able to grow something edible. I could not be prouder. Every other time that I tried to have a garden, everything died. I've mostly only tried herbs and strawberries, but none were ever sustainable. I'd like to blame this on the Sacramento heat, but I am sure I had a lot to do with it. About halfway into this summer, I bought myself a beautiful, little tomato plant for our pint-sized patio. Luckily, this plant already had a few flowers blooming, which would later turn into juicy little gems. I finally kept a plant alive long enough to produce something to use in an actual recipe. That said recipe is this savory herb and tomato focaccia. Speaking of things that I am not very skilled at, I have not had a lot of experience with baking bread. As of now, I am 1 for 2 in terms of successful bread-baking experiences. Well, I'll give myself a 1/2 point for my first try- I mean, it was edible and looked like bread, even if it did not taste very good. I decided to give it a second go around, this time with focaccia. With this focaccia, there is not too much kneading or rising involved, so I figured I could not ruin it too badly. The whole process was fairly quick and surprisingly easy. So on a rainy day last week, a preview of what the weather will soon look like here, I decided to bake and break bread. As mentioned, this focaccia was built around my proud tomato harvest. These home-grown cherry tomatoes were so sweet and juicy, perfectly enjoyable straight from the vine. I decided to throw on some caramelized onion and garlic, with a sprinkle of rosemary, fresh basil, and chunky sea salt. The flavors perfectly balanced each other. Notice that I did not use too much of any of the other "toppings," as I really wanted the bread to shine. Really it would have been scarfed down just as quickly had I left it plain. With the recipe being so simple, I don't think I will ever go back to store-bought focaccia after this life-altering bread experience. And eating it warm? Get out of here! There's no comparison.